One of the things I've been doing as a STEM Ambassador is to help support a Raspberry Pi club at a local high school. At first the club was led by the sixth form students, with the teachers and myself helping out as required. This was working well at first, but with many of the older students now on study leave the momentum has been slowing down. 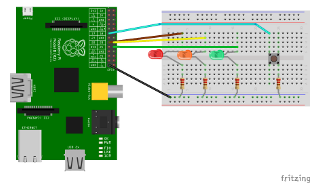 I have therefore created a worksheet on how to program the GPIO ports on the Raspberry Pi to try and give them a bit of hands-on with a bit of physical computing. This is a basic first step (many of the students are still taking their first steps in Python programming). I hope that it helps to get them enthusiastic about what they can achieve by interfacing the Raspberry Pi to the real world. I've made the materials available including a teachers guide, student worksheet and the Fritzing diagram available. It may be useful for other Raspberry Pi / STEM clubs or for teaching in schools.